Be a smart shopper and head start your Holiday gift shopping early in the season! Being proactive will save you time and last-minute headache. We have already started shopping for our friends and family, and here are some of our favorite gifts. 1. We love this classic Céline Bi-Cabas Tote in burgundy/navy. 2. Scarves and shawls always make a great gift, especially if it’s a gorgeous Hermès cashmere stole. 3. Who wouldn’t want to sleep on these fabulous Hermès Op’H printed bed linens? 4. For all those who have an iPad, the Hermès HighHtech leather work station is a no-brainer. 5. 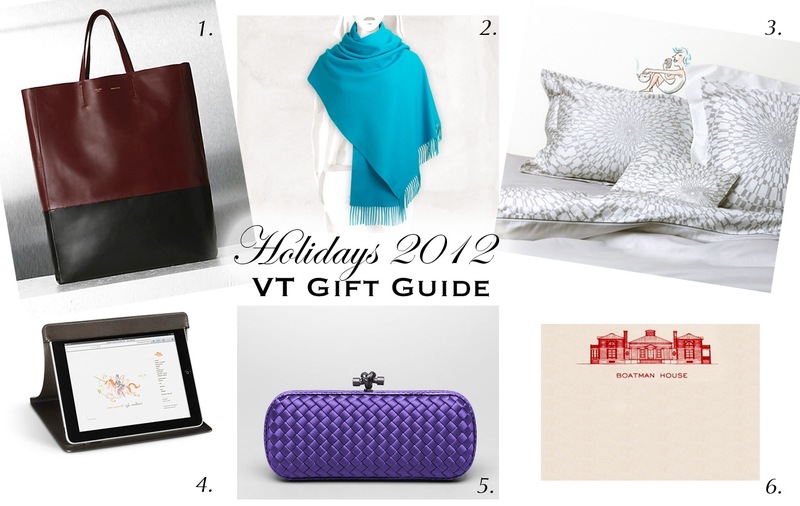 Bottega Veneta stretch knot clutch has been a big hit for us this season, and it makes a great gift for a chic lady. 6. You simply can’t go wrong with beautiful customized Dempsey & Carroll stationery.